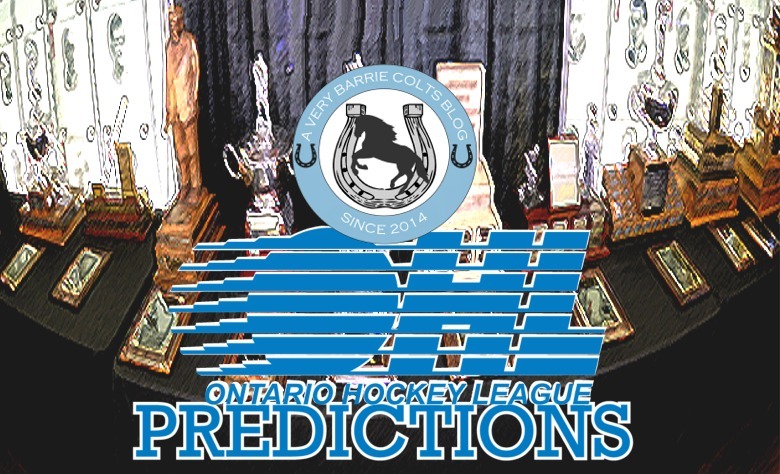 2018-19 OHL Predictions (Standings and Awards) #OHL - Very Barrie Colts | A website covering the Barrie Colts of the OHL. With the start of the OHL season around the corner, we at A Very Barrie Colts Blog decided that we would do season predictions. Here we will share our opinions on how the season standings will look at the end of the regular season, as well as individual award winners. We are a Colts blog, so remember that we may show bias towards the Colts. Included in this post are all 3 contributors of the site, Ryan Noble, Ryan McArthur and Justin Stapleton. For our Conference standings, we all chose our picks for how each conference would look at the end of the season. After all 3 of us made our choices, we assigned points to each team based on their ranking on each prediction. Basically, 1st place got 10 points, 2nd got 9 points all the way to 10th place earning a single point. Beside each team we included the final point total. Our picks for most improved teams in each Conference ended up being unanimous. Contributors choice to win each Division. Justin Stapleton: Ryan Suzuki - Barrie Colts. Arthur Kaliyev - Hamilton Bulldogs, Blake Murray - Sudbury Wolves.